Since the first urban environments of the Roman Empire, to modern day metropolises, our cities have been filled with physical signage that passively direct, lead, and inform our actions and behavior. Many of these signs communicate to us a universal civic code of etiquette, reminding us not to litter, pick up after your dog, and slow down because a school is near. 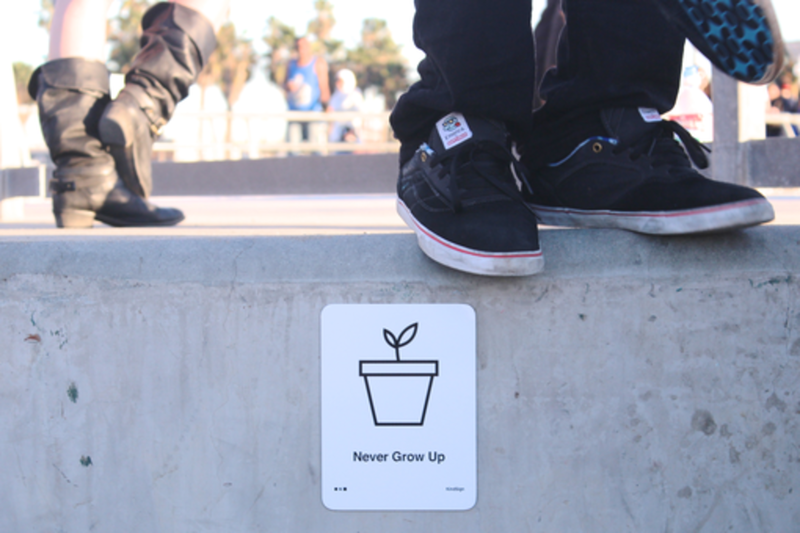 Noun Project is expanding on this idea with KindSigns, an art project that encourages everyday citizens to create signs that communicate personalized, provocative messages to challenge, inspire and delight those around them. Join Noun Project in an exciting workshop where you will create your own KindSign with a powerful pictographic messages. Participants will learn the fundamentals of visual communication and semiotics, how to create an icon, and finally will get the chance to help inspire others. The workshop will kick off with a presentation about the power of visual communication. Then during the next hour, you will play a game designed to help generate ideas for your own KindSign. After this participants will sketch out their ideas. Finally the last 30 mins will be spent on group presentations. After the event, The Noun Project will transform the sketches into polished icons, and print the designs on signage. The final aluminum signage, containing both message & pictogram, will be mailed to each participant to share in their own built environment. Edward is a designer and creative thinker that can always find beauty and inspiration in the world around him. Edward is one of the founders of The Noun Project, a growing open sourced visual dictionary of the symbols and icons that form the world’s visual language. Trained in design and architecture, Edward has always been fascinated by hieroglyphics and modern day symbols, and their ability as a visual communication tool to transcend cultural differences. Before starting The Noun Project Edward was a designer at Gensler, one of the top architectural firms in the country.